This article submitted by Michael Jacobson on 10/27/99. A local Cub Scout den participated in the worldwide Jamboree on the Air (JOTA) thanks to the help of Allen Hertzberg and his amateur radio, commonly known as ham radio. Pictured at far right is Allen Hertzberg. He is surrounded by Cub Scouts of Den 1 and their leader Jeff Ruprecht. On Sunday, Oct. 17, six members of Den 1, along with their den leader, Jeff Ruprecht, visited Hertzberg's home, where they were given a tour of his radio equipment, including the antenna, maps, and receivers. Hertzberg scanned the waves and found another ham operator for JOTA in White Springs, Wyo. This man, a former Boy Scout leader, had set up a portable radio in a local shopping mall and was making it available to any scouts in that area during store hours. Hertberg was happy to connect with someone in Wyoming because normally it's difficult to reach. "It was quite a thrill for me to get in there, too," he said. Local Cub Scouts Kody Bengtson, Sam Bungum, Zach Cole, Andrew Moser, Christopher Moser, and David Ruprecht took turns speaking on the air waves. The boys said their name, age, rank, and a little about their hobbies or interests. Jeff Ruprecht said the Wyoming man did a great job of talking with our scouts. "He would really stir up conversation," Ruprecht explained. "He kept the kids really interested." Some of the boys were shy at first, but they did a good job, according to Hertzberg. A couple more times, he thought, and they'd be like old pros. Topics of conversation included the Vikings and the types of fish in Wyoming compared with those here. 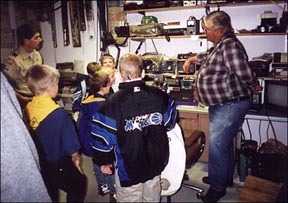 The boys also had to learn how to press the button to talk and to release it to listen. "Boy, they were really fascinated," Ruprecht said. "I was, too." Ruprecht said he was interested to learn that ham radio cannot discuss politics and cannot broadcast commercial advertising. Part of their value to society, Ruprecht said, was during emergencies. When normal communication is cut with an area during a storm or natural disaster, typically radio operators are the first to report from the affected areas. Hertzberg was an excellent host, according to Ruprecht. "He was super," said Ruprecht. "We really appreciated him. He's really knowledgeable about ham radio." For the visit, the Cub Scouts in the den will receive a communications badge as well as a 42nd Annual JOTA patch. Ruprecht said he is elaborating on communications with a brief history of its evolution, from telegrams and the Pony Express to the telephone and the Internet. Aaron Savelkoul is also a member of Den 1 but was unable to attend the radio demonstration.